Publishers and book clubs sometimes include promotional items in a book about either the author, the book itself, or other books for sale. I collect these ephemera when I find them, particularly those of a certain vintage from the early twentieth century and before (those featured here today are much newer). 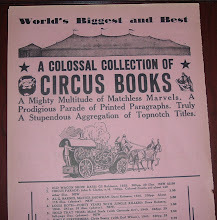 It is unusual, however, to find the variety of ephemera I found in the book shown here. Tucked away in a first printing of The Hard Awakening, by H.B. Dehqani-Tafti (Seabury Press, 1981), several items of related book ephemera surfaced and entered my collection. Somebody made my job of finding bibliophemera a lot easier by including multiple items for this book and making it convenient for discovery some thirty years later. The ephemera consists of a bookplate, bookmark, and a catalog of these items as well as additional books for sale. Each item is featured separately in the images below. The book was written by the the first Iranian Bishop of the Episcopal Church in Iran during the first year of the Iranian Revolution, following the Shah's ousting, as the revolutionaries were taking power. With all the ensuing chaos in his country, the author left and was living in exile in England when the book was published. His account provides an insider's view of changing times in Iran during the late 1970s. Some of what the Bishop endured during that time is recounted in a memorial to him on the blog Not Worthy of the Name. Back to the ephemera... The bookplate features the old lion and sun symbol of Iran. It was replaced after the revolution. I have no clue what the writing on the bookplate represents. The book mark is double-sided and identified as a Hillspeak bookmark on one side with the accompanying quote from Bishop Dehqani-Tafti: "What is life worth if it is not lived for a purpose higher than one's own life? And what higher purpose than to do the will of God?" The reverse side offers another quote from Dahqani-Tafti: "You have taken the heavier burden, and therefore His grace will be all the more intense for you." There is also the symbolic bloody hole on both sides of the bookmark. This may signify Christ's sacrifice on the cross, or perhaps it alludes to an attack on the Bishop and his wife in Iran. They were shot at while sleeping in their beds one night. The Bishop's wife was wounded in the arm, but the Bishop was not hit. He later found on his pillow four bullet holes on either side of where his head had been. It wasn't his day to die. Whether a nail or a bullet, the bloody hole makes for a dramatic design on the bookmark. Finally, there is the catalog of books, bookplates, bookmarks and other items from Hillspeak, a society that promotes the activities and knowledge of the Episcopal Church through various publications and promotional items. The rear flap of the book's jacket has a sticker affixed to it that states "A Selection of the Episcopal Book Club." I suspect that Seabury published the book for the Episcopal Book Club (operated by Hillspeak) or at least reserved a number of copies for them and that's how their literature and ephemera found its way into the copy I have. 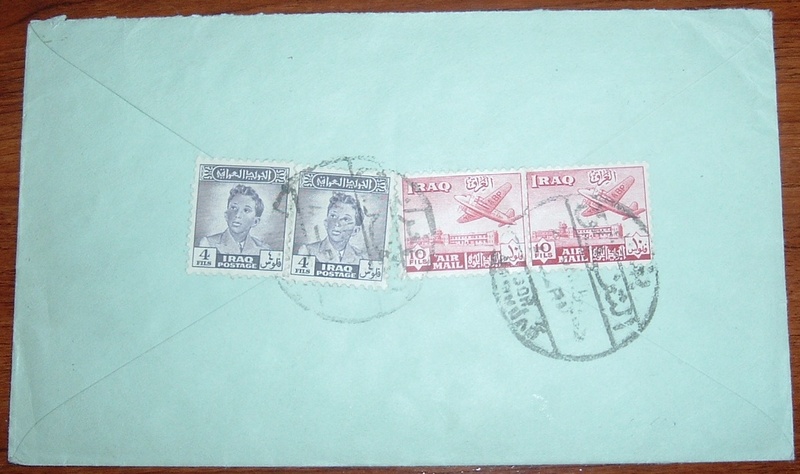 Cameos are small embossed advertising graphics on postal covers, popular in the nineteenth century. They are highly collectible today with the more elaborate designs for unusual businesses reaching prices upwards of a thousand dollars, some a good bit more. Most I've seen seem to fall in the $100 to $200 range. An exception was this little booksellers & publisher's cameo I picked up for around $15. It did have a tiny tear and was on the back of the envelope. The design is pretty much a standard shield, so those factors add up (or down) to an affordable cameo. To see examples of what is also termed cameo corner card covers, click HERE for some interesting (and expensive!) designs that have sold at auction. A bookseller's cameos or anything book related is very scarce. 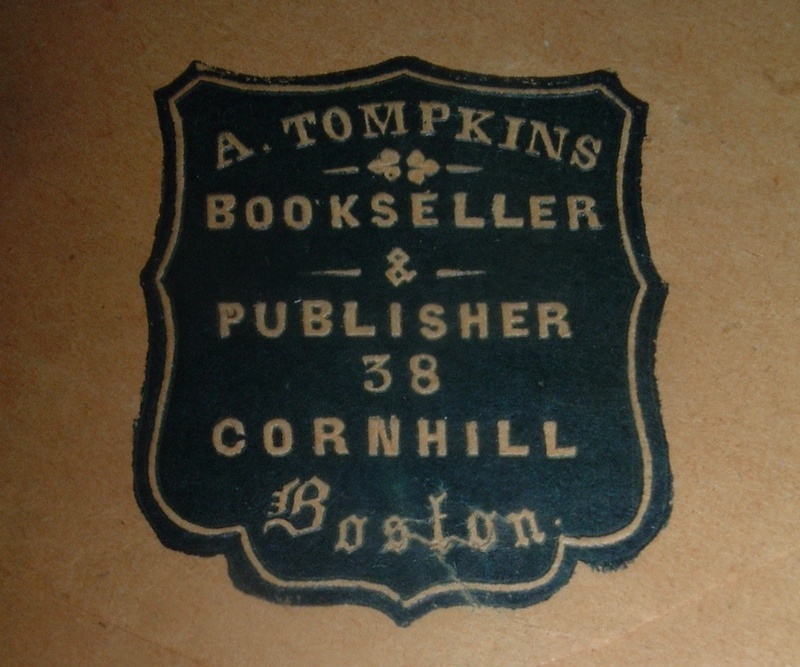 A. Tompkins was Abel Tompkins, a Universalist bookseller and publisher in Boston. His book shop was on Cornhill, a street known as an important center for the book trades in Boston during the 1800s. Tompkins' shop was at one time the headquarters of the Universalist ministers. Just as I began to think I was in for a struggle to piece together bits of biographical data on Tompkins, I stumbled upon an obituary page from 1863 (year of Tompkins' death) from the Universalist Register, which provides a nice little biography of Mr. Tompkins. The preceding link takes you to it, but I'll also copy it here in case the site, or that page, disappears one day. 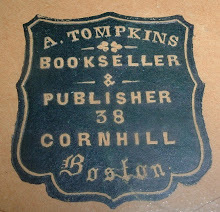 Abel Tompkins, (the publisher for 26 years of our "Ladies Repository,"-for 14 years, of our "Register,"-for 13 years of our "Quarterly,"-for 12 years of our "Rose of Sharon," and, during the past 25 years, of a large proportion of our Sunday School and other denominational books,) died in Boston, April 7, 1862. Born in Boston, June 22, 1810, he was reared there, and learned book binding. In 1830, he became much interested in Father Ballou's preaching, and exerted himself to get up the Sunday School in his church, and to effect improvements in the appearance of our books. In 1836, he purchased the "Ladies' Repository," and opened a small bookstore. From this period, his name is intimately connected with our literature, the encouragement of our literary talent, and the general progress of our cause in Boston and the region round about. Whatever he touched showed his correct taste and improving skill. He was one of the earliest members of the Warren street church, and among the first to discern and encourage the merit of our early writers-Mrs. Scott, Mrs. Mayo and her husband, Mrs. Jerauld, Mrs. Soule, E. H. Chapin and others. When the "Universalist Expositor," after several ineffectual efforts was abandoned, he revived it, and as the "Universalist Quarterly," continued it to his death, leaving an injunction to continue it, if possible. Yet it was never a profit, often a loss to him. The "Rose of Sharon," (1840-1852) was one of the best annuals of its time, and did more than any other work, to introduce favorably to the outside world, Universalists and their writings. He was ever planning and working to exalt, improve and extend a knowledge of the character of our denomination, and his first thought in undertaking any publication, seemed to be whether it would be creditable and usefu1 to our cause. Yet admirable as was his denominational spirit, he was equally estimable for his public and social, and beloved for his domestic and private life. He honored nobility of soul, and goodness, scholarship, and genius of whatever sect-whatever was beautiful in nature or art, or excellent in humanity. Thus intelligent, genial, and affectionate-forbearing, generous and charitable-he died as he lived, a Universalist; and those who knew and loved him, in their admiration of the man, and sorrow at his death, forget (if they knew) that he had any of the imperfections and frailties of our common humanity. Coincidentally, the sender of the letter with the Tompkins cameo was Rev. Otis A. Skinner, whose biography is also listed an a Universalist Register obituary page. Nothing on the recipient of the letter, though--Rev. 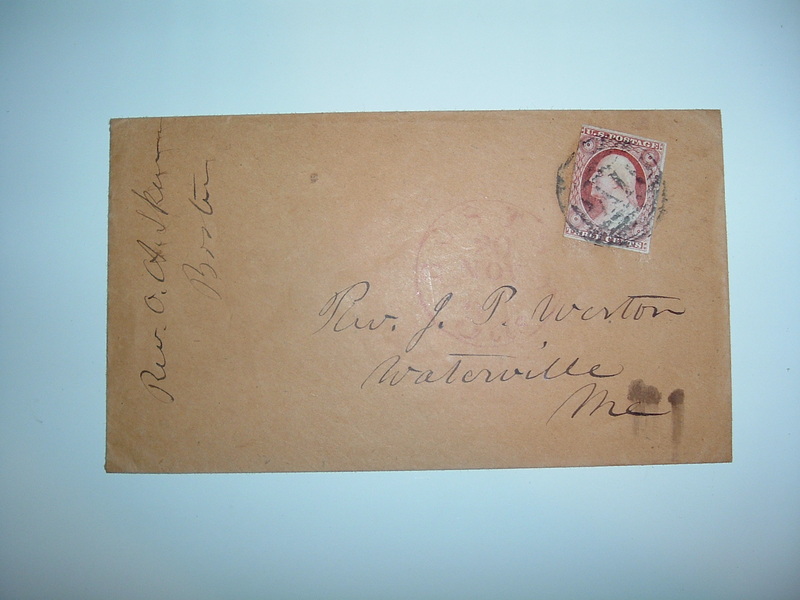 J.P. Weston of Waterville, Maine. Yes, Bookshope (a spelling translation error perhaps). 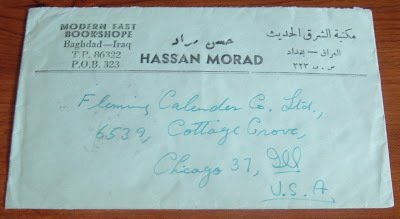 Modern East Bookshope, to be exact, according to this piece of postal history from Iraq. 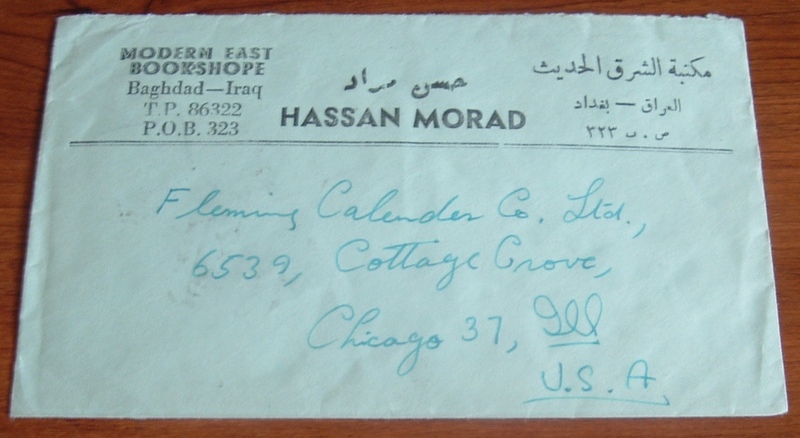 I cannot find one iota of information about this book shop (or shope) or Hassan Morad, whom I assume was the shop's proprietor. I wonder, though, if the shop might have been located on Baghdad's historic street of booksellers, Mutanabbi Street, much of which was destroyed by a car bomb on March 5, 2007. 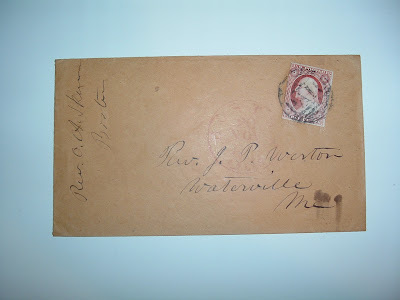 The backside of the envelope could offer some clues about the time period that the Modern East Bookshope was in business, but the cancellation date is illegible. The stamps however are a good backup to determining the year. I can't find them yet, but they appear to be 1930s or 1940s issues. 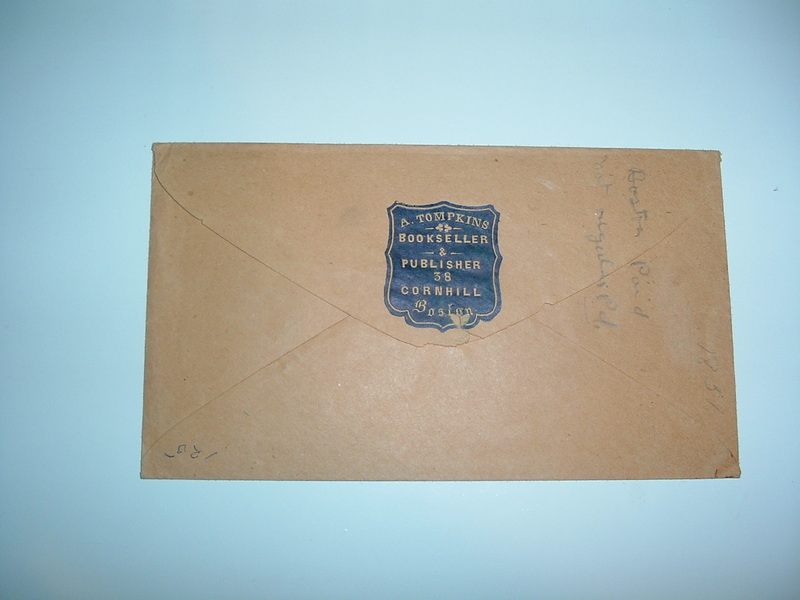 The addressee on the letter, Fleming Calendar Company, appears to have been in business from the 1930s-1950s, as records available on the Internet would indicate. 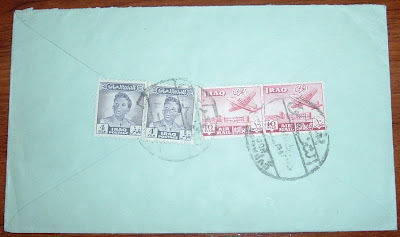 That's consistent with my guess on the stamps' issue date. This last paragraph has nothing to do, specifically, with the postal cover above, but it relates directly to both ephemera and books. 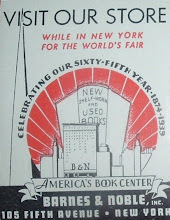 I came across something interesting while researching the Modern East Bookshope and I wanted to include some information about it here. The response to the bombing of al-Mutanabbi Street evoked outrage, resulting in at least one creative project I know of--The Al-Mutanabbi Street Coalition, which called on letterpress printers to create broadsides to protest and commemorate the bombing. More than 100 (130 by some counts) broadsides have been created thus far and are permanently housed at the Arthur & Mata Jaffe Center for Book Arts, in the Wimberly Library at Florida Atlantic University. 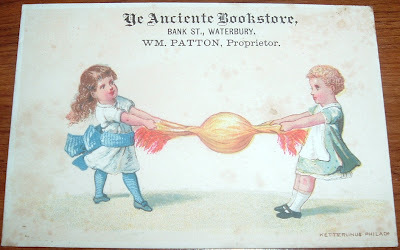 Here's a pair of Victorian trade cards that offer a bit of bookselling and printing history, with an unintended vocabulary lesson thrown in. 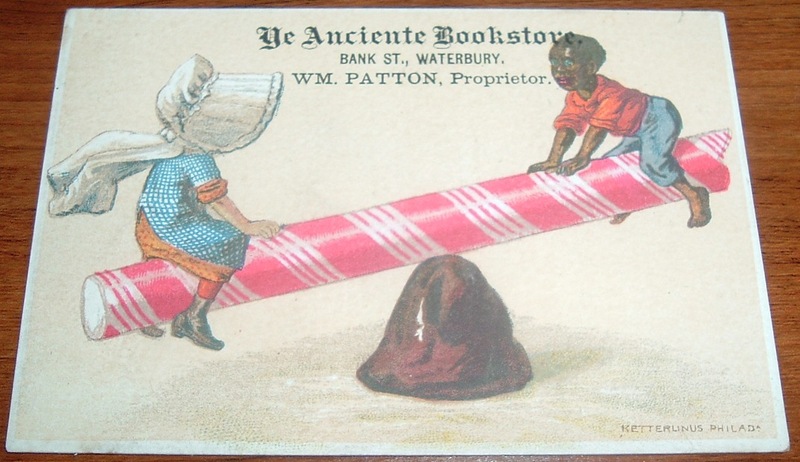 As usual, these cards offer images that are colorful and attractive (children playing games in this case), but have nothing to do with the business they represent. Oftentimes, the bookseller would have his business particulars printed on the reverse side. With these cards, that information is printed on the illustrated side in only three lines. The reverse side is blank. Both cards were printed by Eugene Ketterlinus in Philadelphia (fine print in lower-right corner), whose building, coincidentally, was demolished in the 1960s for the U.S. Mint building (so... from print to mint). On that same site in the 1850s, a bookseller had plied his trade. Ketterlinus demolished that building and built a new structure in the 1850s, ensuring a long business history at that location from books to printing (from trade cards to money). William Patton, the bookselling proprietor listed on the above trade cards, was born in 1809, probably in Brooklyn, NY, as that's where his Scotch-Irish parents immigrated. Here's where the vocabulary lesson comes in. Patton grew up in New York and became a button chaser. Taken literally, that occupation conjures up some strange visuals. It took a bit digging around the Internet and even a few books (old-fashioned research) to find what I think is the answer. A button chaser was an engraver of some sort. Perhaps silver or perhaps prints. For Patton, I would think prints because he was known to be an avid reader and discovered he liked bookselling better than button chasing (apologies to the grammar police if I just verbed a noun... oops, I did it again). He came to Waterbury a button chaser and became one of the first in town to engage in that line of work. His love of books and reading, however, turned his attention to the bookselling business, and he became the pioneer bookseller of Waterbury--the very first one. He continued in that business for over forty years, adding newspaper publishing and a bookbindery to his business in 1848. He had his trade cards printed in Philadelphia (why not New York, I wonder?) by Ketterlinus. 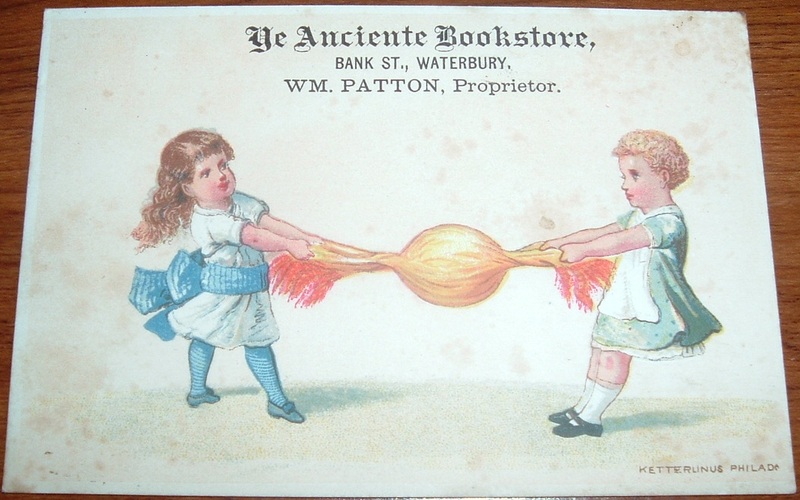 At the time these trade cards were issued, the name of the business appears to have been Ye Anciente Bookstore, but I don't know if the business always had that name. In 1848 he located in the old Lyceum Building, and connected a book bindery with his store. In 1852 the store was removed to the Arcade, and in 1859 to the Hotchkiss Block. Shortly afterward the store was removed to the present Ells Building, on Bank Street, where the business was carried on by Mr. Patton until 1883. In that year it was sold to George N. Ells, who conducted The Haunt under his name until his death a few years ago. 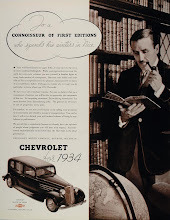 The George N. Ells Company was then organized and the business has been carried on under its management since the death of Mr. Ells. A good source for information on William Patton and the history of Waterbury, Connecticut was found in the book, The Town and City of Waterbury, Connecticut, from the Aboriginal Period to the Year Eighteen Hundred and Ninety-Five, edited by Joseph Anderson, D.D. with the Assistance of Anna L. Ward (Price and Lee, 1896). Alas, this and other sources took it for granted that a reader or researcher in 2010 would know what a button chaser was. I'm still not completely sure, but I think I've narrowed it down, though the term's etymology eludes me. I still don't see any connection between the name and the work involved. Thankfully, bookseller is a name that has run a consistent course of nomenclature throughout the previous millennium. I wonder, though... In 2110, will some historian researching an old seller of bits and bytes of digital information puzzle over the term bookseller? 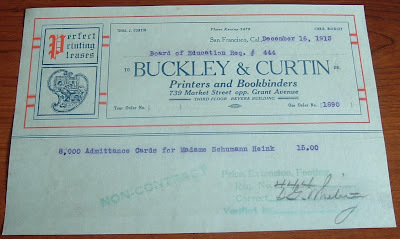 Buckley & Curtin were printers and bookbinders in San Francisco around the turn of the last century. Other than their billhead above, I can find barely a trace that they existed. So this post is about to veer off on a tangent into unbookish waters because there's enough on the name associated with the order to keep this post going. From Buckley & Curtin's billhead slogan, I assume that printing was their mainstay, more so than bookbinding, and they aimed to please with perfection: "Perfect Printing Pleases." I hope for their sake that their customer was perfectly pleased with the order. But then the total cost for all that was only $15. 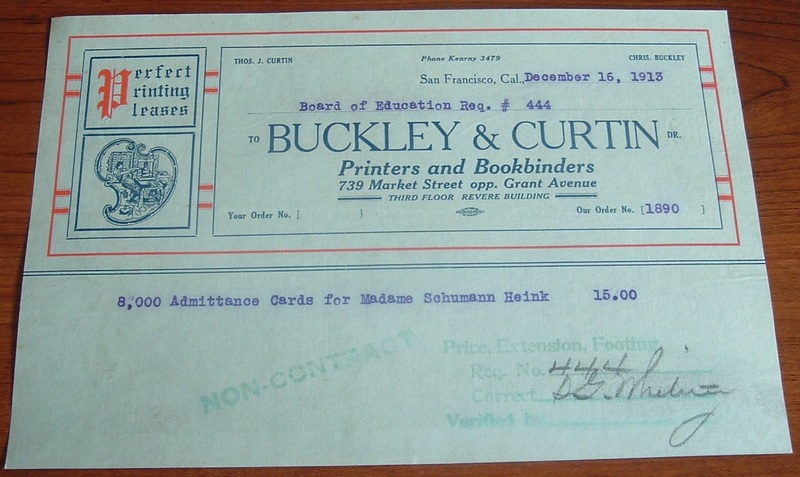 The Board of Education (San Francisco I presume) ordered 8,000 admittance cards for Madame Schumann-Heink back in December of 1913. Had the Board not liked the final product, they would have had 8,000 reasons to be angry with Buckley & Curtin. Sounds like a lot of cards and a lot of admittance to something. But admittance to what? Finding the answer to that question begins with asking another question. Who was Madame Schumann-Heink? Ernestine Schumann-Heink (15 June 1861 – 17 November 1936) was a celebrated operatic contralto, noted for the size, beauty, tonal richness, flexibility and wide range of her voice. The lowest of the female voice-types, this is an extremely rare bird and true contralto roles are few and far between. I'm guessing the Board of Education had something to do with a concert for the rare bird, Schumann-Heink, and was trying to bolster attendance at her shows with the admittance cards (what else could the be for?). Coincidentally, at the time of this billhead, Schumann-Heink was living on about 500 acres near San Diego. So maybe she was touring California giving concerts and San Francisco was one of the stops. But why the Board of Education needed 8,000 admittance cards for her show was another mystery. As I researched this, I wondered if there was even a venue in California in 1913 that could seat 8,000 or more? None of the old Opera Houses I've come across would seat anywhere near that number. And if she could have gotten 8,000 people to come hear her sing, she must have been a rock star of her times. ...managers of the San Diego Panama-California Exposition declared March 22, 1915 "Schumann-Heink Day." 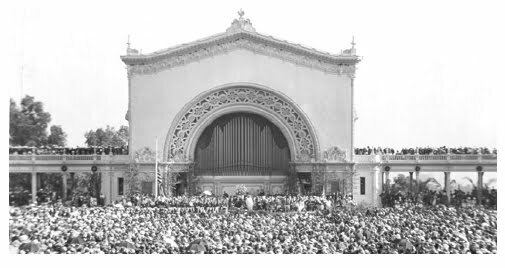 Some 6,000 schoolchildren sang "America" before the singer at the Balboa Park Organ Pavilion. Mayor Charles O'Neall presented her with an honorary citizenship award. In return, she promised to give a free concert at the Exposition in June. On the evening of June 23, the eagerly-awaited event occurred. For the over 27,000 people at the Pavilion, it was the event of the year. A San Diego Sun reporter reached for the limits of hyperbole: "The greatest organ, the greatest voice, the greatest chorus, the greatest outdoors on earth, she's golrious (sic)." At the diva's request, attendants allowed children under 16 to enter the grounds free. So she was a "rock star!" I'm astounded by the 6,000 school kids singing for her and the 27,000 that attended her concert. This was 1913 and those numbers seem quite astonishing. Many star performers today don't get those kind of attendance figures. I once saw Luciano Pavarotti, an operatic superstar of his time, in a venue that seated about 15,000 and maybe half the arena was filled. And with that, I guess this post is over. 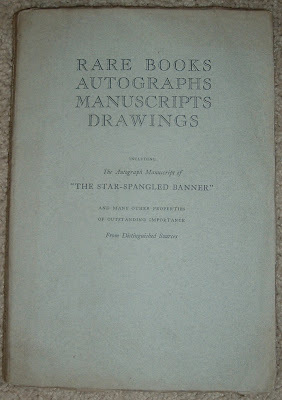 For Independence Day in America and all the proud displays and waving of the country's star-spangled banner, here's a rare books auction catalog that features the autograph manuscript of The Defence of Fort McHenry, otherwise known as The Star-Spangled Banner, the nation's anthem that will be heard "o'er the land of the free and the home of the brave" today. 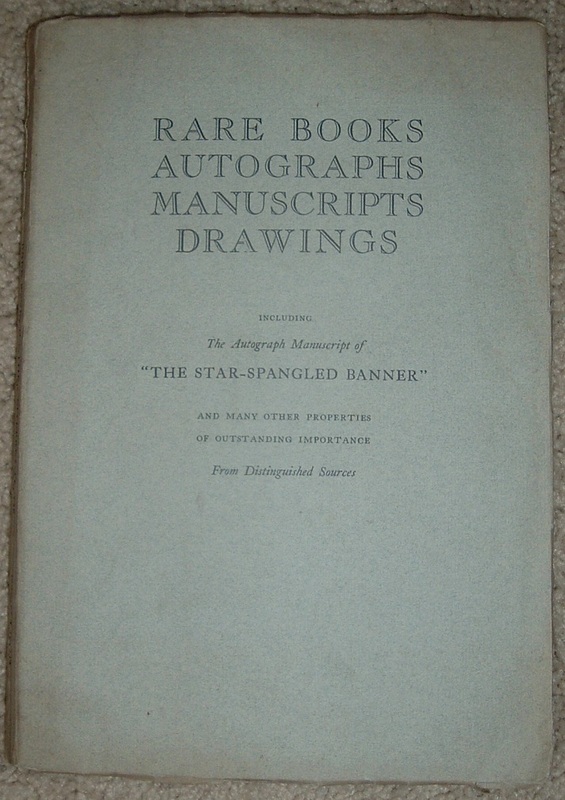 This catalog sports the lengthy title: Rare Books, Autographs, Manuscripts, Drawings, Including the Autograph Manuscript of "The Star-Spangled Banner" and Many Other Properties of Outstanding Importance from Distinguished Sources. The auction was held at American Art Association - Anderson Galleries in New York City, with the sale (Sale 4073) conducted by Hiram H. Parke and Otto Bernet, who would later open their world famous Parke-Bernet Galleries. 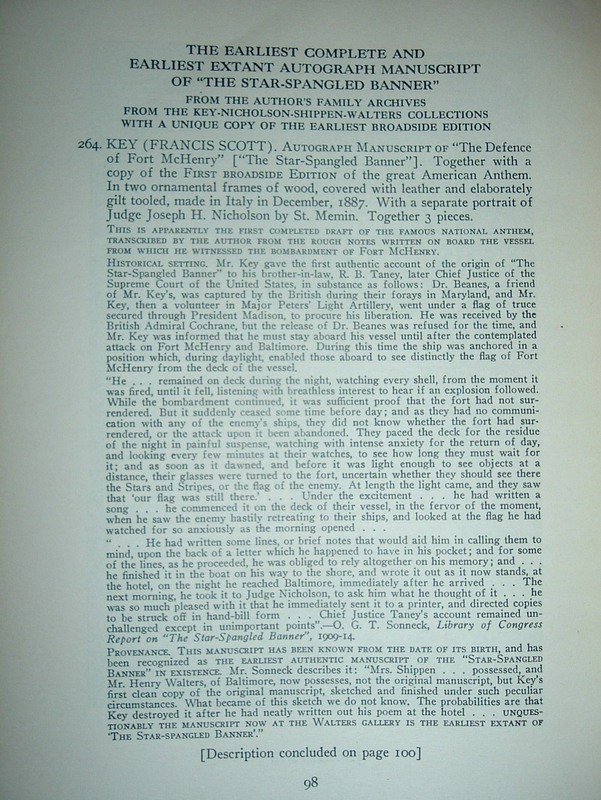 But in January of 1934, they were auctioning from the collection of the late Henry Walters the original autograph manuscript of Francis Scott Key's The Defence of Fort McHenry ["The Star-Spangled Banner"] together with a unique copy of the earliest broadside edition. During the War of 1812, Francis Scott Key, an American lawyer detained on a British truce ship in Baltimore Harbor, witnessed the bombardment of Fort McHenry through the night of September 13, 1814. Early the next morning, as daylight revealed to him that the American flag still flew over the fort, he knew the defense had been successful, and he was inspired to write the poem In Defence of Fort McHenry. 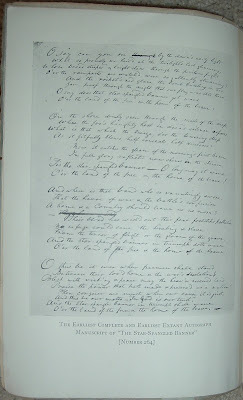 A few days later, released by the British, Key copied and revised his poem and showed it to Judge Joseph H. Nicholson, his wife's brother-in-law who was a commander at the fort during the bombardment. 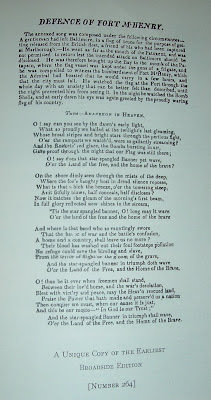 Nicholson's reaction was very enthusiastic and he quickly had it printed into broadsides that included instructions for singing it to the tune of an old British drinking song "To Anacreon in Heaven," which Key had in mind while writing the poem. 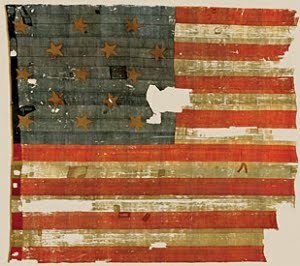 The broadsides made their way around Fort McHenry and the city of Baltimore, where a month later it was performed for the first time to music with the title changed to The Star-Spangled Banner. 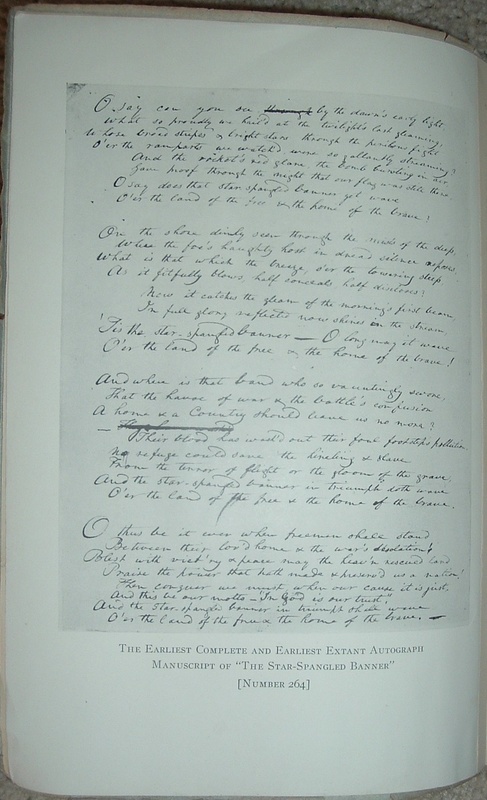 But Key's handwritten verse that was used to have the broadsides printed evidently stayed with Judge Nicholson. It would be handed down through the Nicholson family for the next 93 years. In 1907, it left the family and was purchased by Henry Walters, referenced earlier in this post (see link above). He died in 1931 and the manuscript went on the auction block three years later as the premier item listed in the catalog pictured near the beginning of this article. The Walters Art Gallery (yes, Henry Walters) purchased the manuscript at this auction for $26,400. They held it until 1953 when the Maryland Historical Society purchased it for the same price that the Walters Art Gallery had paid in 1934. The manuscript still resides in their collection today. 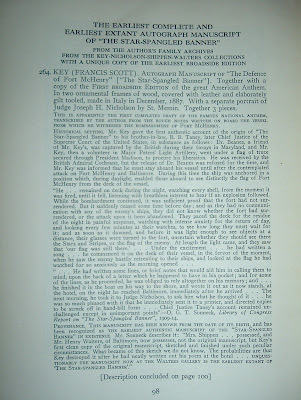 As an afterword to the history of Key's manuscript and its passage through the American Art Association - Anderson Galleries' auction catalog, for which I have presented my copy here, it's interesting to note that it wasn't until March 3, 1931 that the Star-Spangled Banner became the national anthem of the United States. One-hundred and sixteen years after it was first written, President Herbert Hoover signed an act into law. 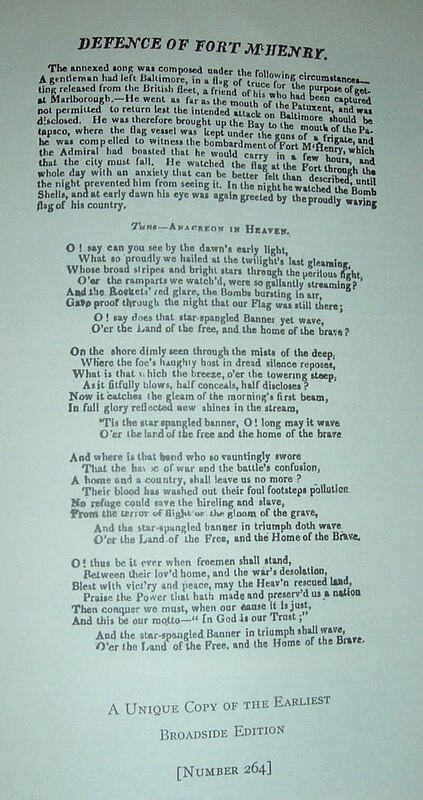 In celebration of July 4th, many patriotic songs will be sung and played by orchestras across America, but Francis Scott Key's inspired verse will be at the head of that musical parade.